​Mooring cover for our 34" VOYAGEUR constructed from high-strength dimensionally stable, abrasion, mildew and UV resistant, 100% woven & coated polyester, designed for rugged outdoor use. 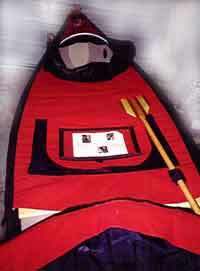 This cover has end pockets that slip over the bow & stern held in place with shock cord -- sides are attached with nylon clips hooked under the gunwales -- center hooks are adjustable, package come with foam support blocks to help shed water. Environmentally friendly "hunter green" material. Mooring cover for our 25' Selkirk. Specifications same as 34' cover above. 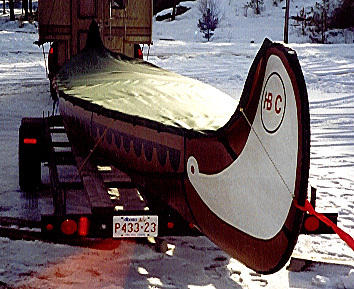 By filling in the needed measurements we can build your deck to give a custom fit to your canoe. We have patterns for many models from Dagger, Mad River, and Old Town. Deck material is UV resistant and non-shrinking and is available in six colours. Cockpits are built large with a Velco opening up the front and elastic waist. This allows for easy escape in case of rollover, plus allows for fit while sitting or kneeling. On a hot day, when it is not needed it can be opened for comfort. The standard deck configuration will come with two cockpits and a cargo hatch. If you take a third passenger along on your trips (kids or the dog) you may want to add a spot in the deck for them. An additional cockpit or hatch can also be used when soloing your boat. 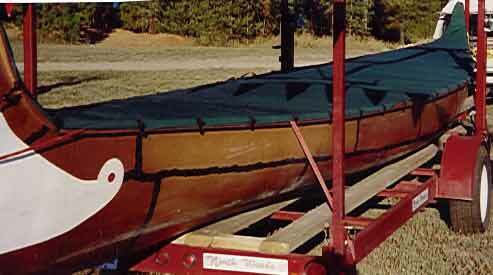 In interest of safety, many customers have requested that a second paddle pocket be added to the deck. 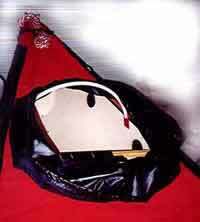 This will ensure that you will have immediate access to a paddle in emergency situations. Clear vinyl with Velcro closure. 15" x 17"